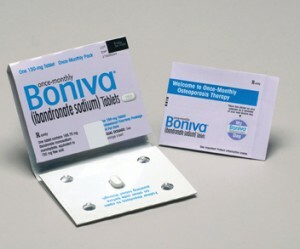 Boniva (ibandronate) is a bisphosphonate prescription medication used for the prevention and treatment of osteoporosis, or thinning of the bones. It is only licensed for use in women who have gone through the menopause. Ibandronate is produced under the following brand names: Bondronat® and Bonviva® by Roche, and Boniva® by Roche and GlaxoSmithKline. Bone mass loss is at its peak in post-menopausal women, and losing density can contribute to fractures in the spine, arms, and legs. In elderly women, broken hips are a common occurrence because the bones become brittle. Boniva is not for use among children or teenage girls. It is for post-menopausal women only. Boniva is available orally in 150mg tablet form or can be administered intravenously in doses of 2 to 6 milligrams via injection. After it is injected into the body it does one of two things: it either bonds directly with the bones that are losing mass or it is immediately excreted in urine. Boniva alters the cycle of the formation of bones and breakdown in the female body. In some cases, Boniva might be used in the treatment of other disorders, but it is not listed here. Contrary to popular belief, bone is not a permanent solid structure in our bodies, but a living tissue that undergoes a cycle of breaking down and building up again. Bone has three main cell types: osteoclasts which cause bone breakdown, osteocytes which maintain bone tissue, and osteoblasts which produce new bone. Osteoporosis is a condition where the bones thin and the bone mass density (BMD) is reduced. It is a condition that affects primarily post-menopausal women, because estrogen (a hormone affecting menstruating women) prevents bone breakdown. Whether a post-menopausal woman develops osteoporosis is due to a complex interplay of factors including genetics, their BMD during early adult life, and the levels of calcium and vitamin D in their bloodstream. Osteoporosis is a common condition, and many patients take Boniva or one of the other bisphosphonate medications. Ibandronate works by limiting the amount of bone broken down by inhibiting the actions of the osteoclast cells. This prevents further deterioration of the bones and also increases the BMD. Boniva medication can take a while to start to work on improving your bone thickness, between six months and a year. You will not feel any difference by taking Boniva. However, it is important to treat your osteoporosis because otherwise patients with osteoporosis have a high risk of breaking bones, which can require a hospital stay and surgery to fix. This can be a very traumatic experience, especially in the elderly, and can affect their confidence with walking around if they are scared of falling. You should also let your doctor know if you are pregnant, planning a pregnancy or breast feeding as your treatment may need to reviewed or adjusted. Arrange blood tests for you to test your kidney function and electrolyte levels. Arrange a dental check-up to examine your jaw, as Boniva can cause damage to your jawbone. Start you on a medication which contains calcium and vitamin D, as this will also help to prevent or improve osteoporosis. Arrange a scan to measure the thickness of your bones (DEXA scan).